A little messy, but totally worth it. 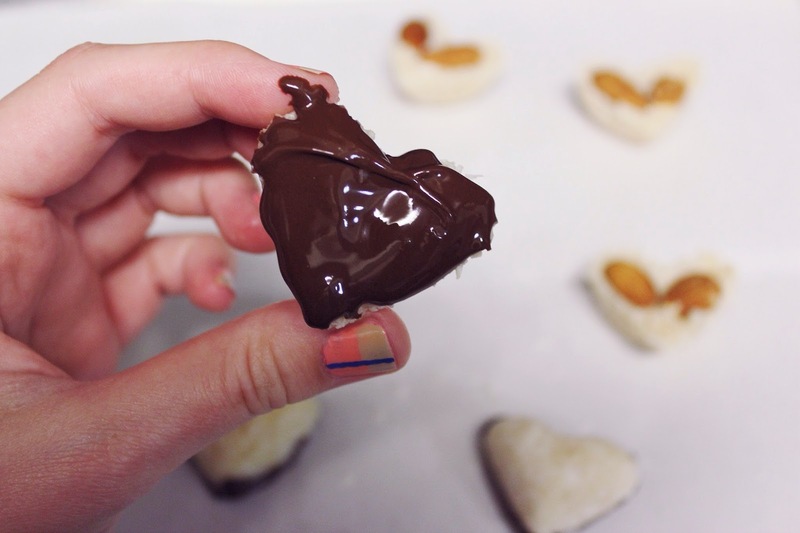 The items above are all it takes to make the filling for these chocolates. Surprisingly, these four clean ingredients combine into something sensational - that, honestly, taste just like the real thing. 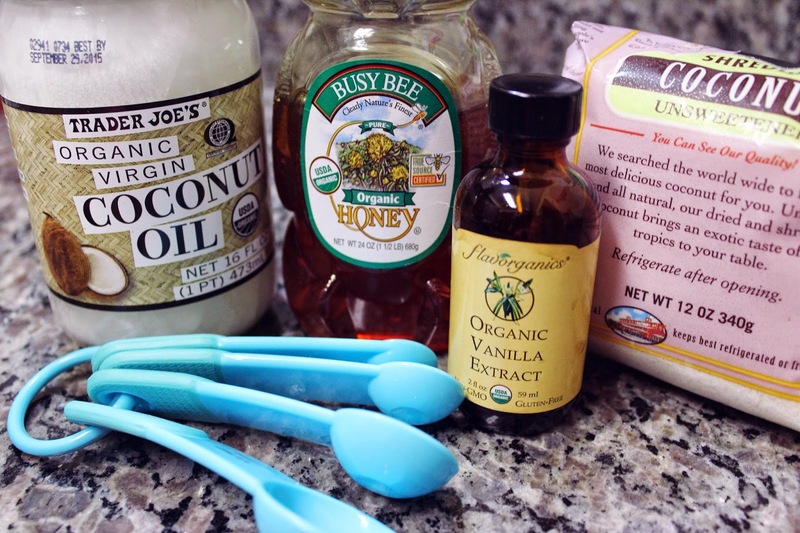 Into a blender, combine 1 cup of unsweetened shredded coconut, 4 tbsp of honey (or pure maple syrup), 2 tbsp of coconut oil, and 1/2 tsp of vanilla extract. 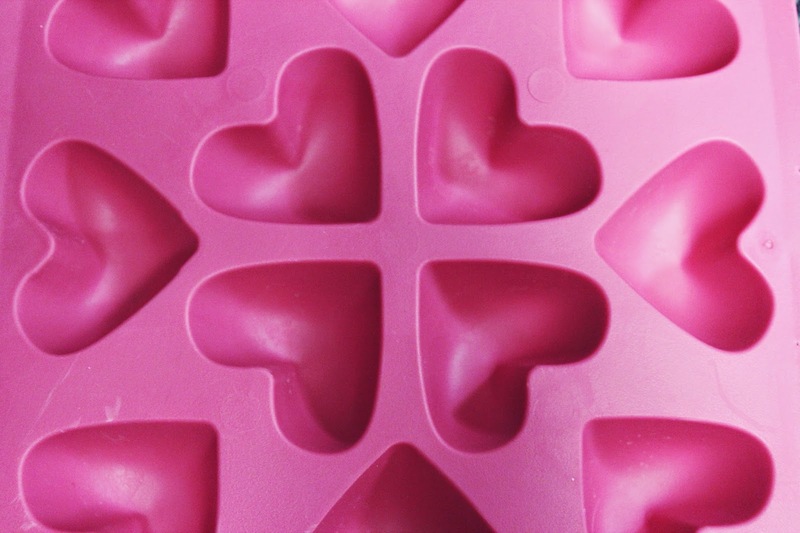 Next, get out an ice cube tray. Any kind will do...I just happened to have this adorable one on hand. 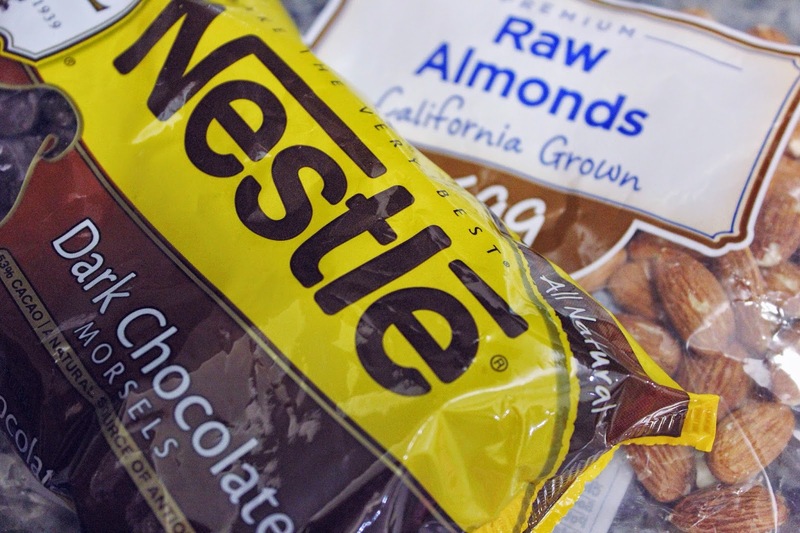 You'll also need dark chocolate and almonds. 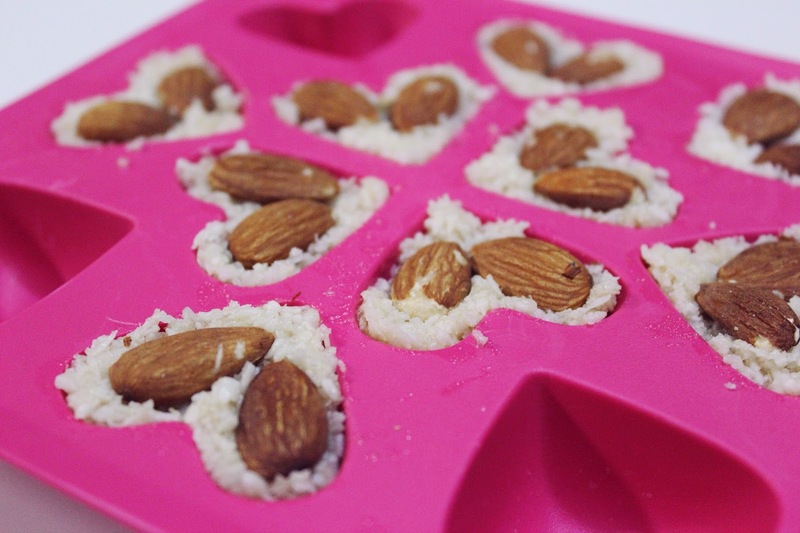 Fill the tray with your coconut mixture and top it off with an almond (or two). 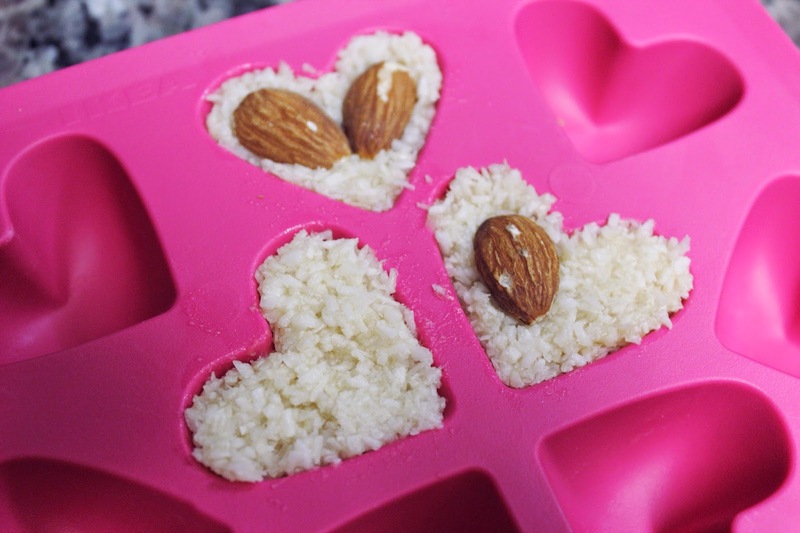 Once you've used up your coconut filling, place the ice cube tray in the freezer for at least 20 minutes. The longer you leave them in, the easier they'll be to coat in chocolate. 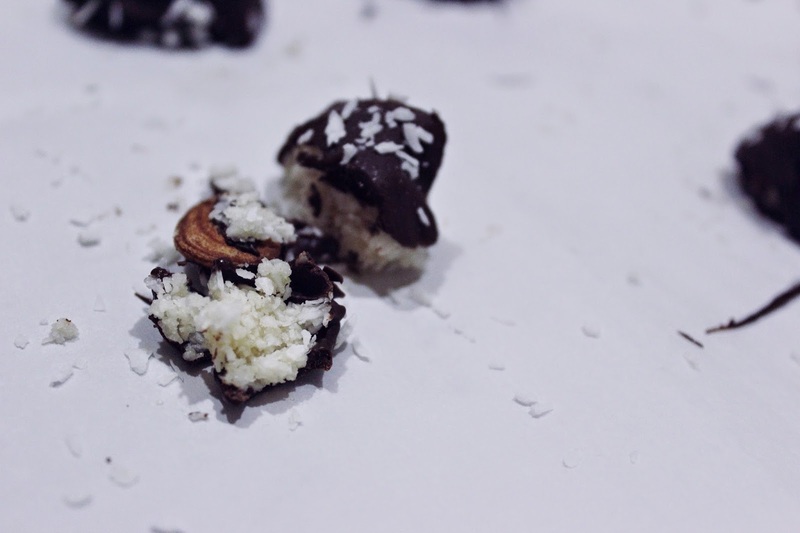 While your little candies harden in the freezer, melt about 2/3 cups of dark chocolate in the microwave with a small dab of coconut oil (to add smoothness and shine). 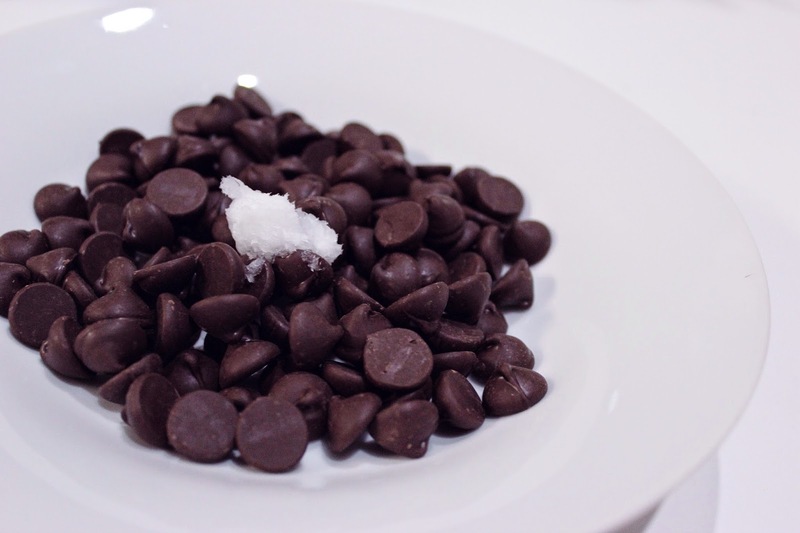 Melt the chocolate in 30 second intervals, until completely smooth. Next, take your candies out of the freezer. 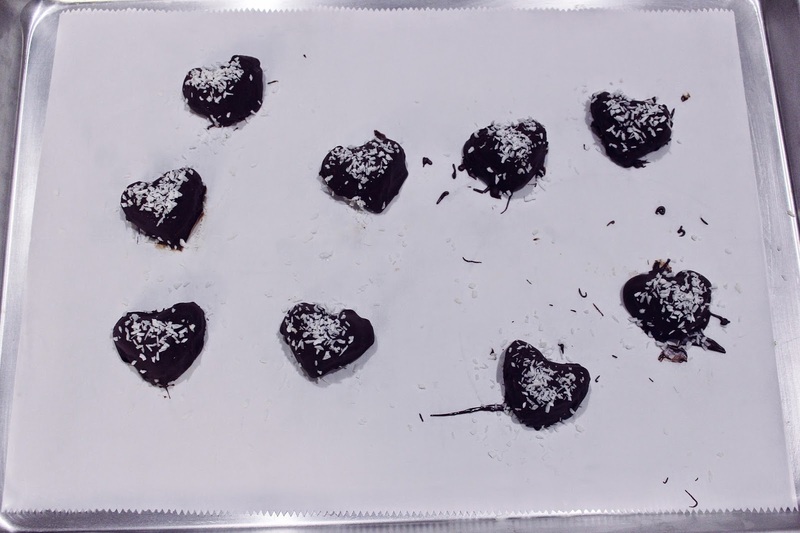 Plop them out of the ice cube tray and set them onto a baking sheet lined with parchment paper. Parchment paper is a lifesaver (I've said this before and I'll say it again). 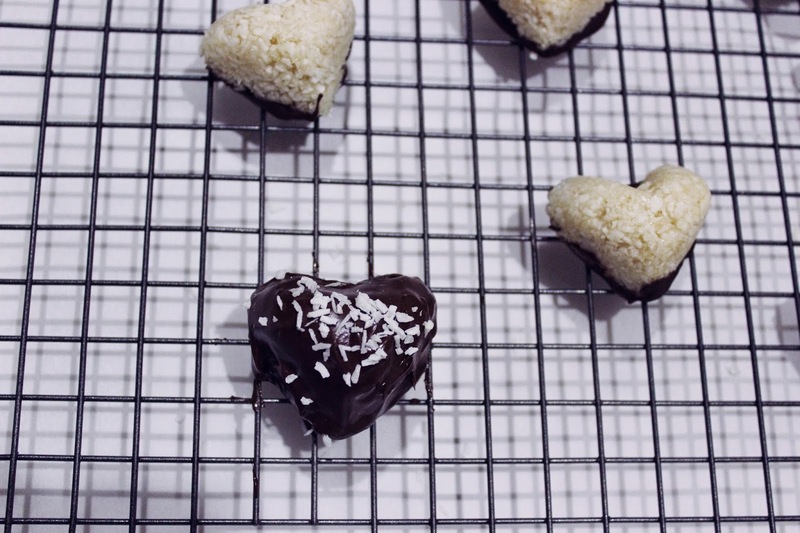 Covering things in chocolate (and getting them to look perfect) is always a bit tricky. 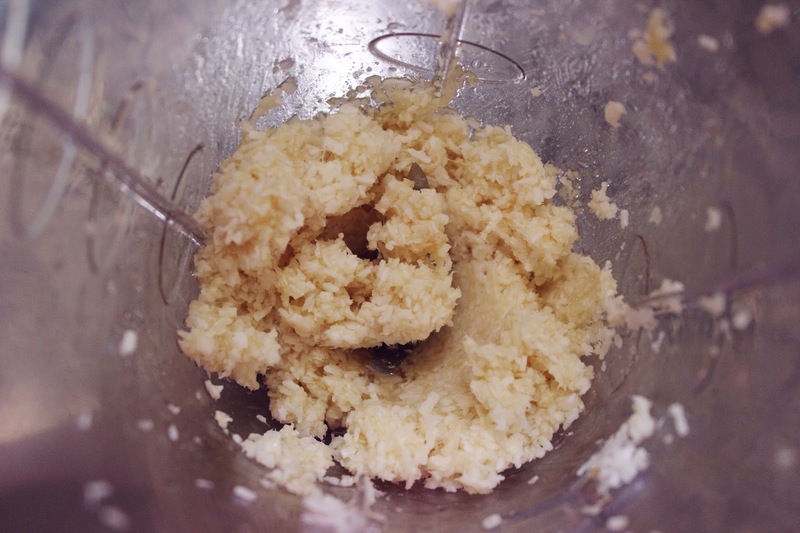 However, I think the method I used was probably one of the easiest. 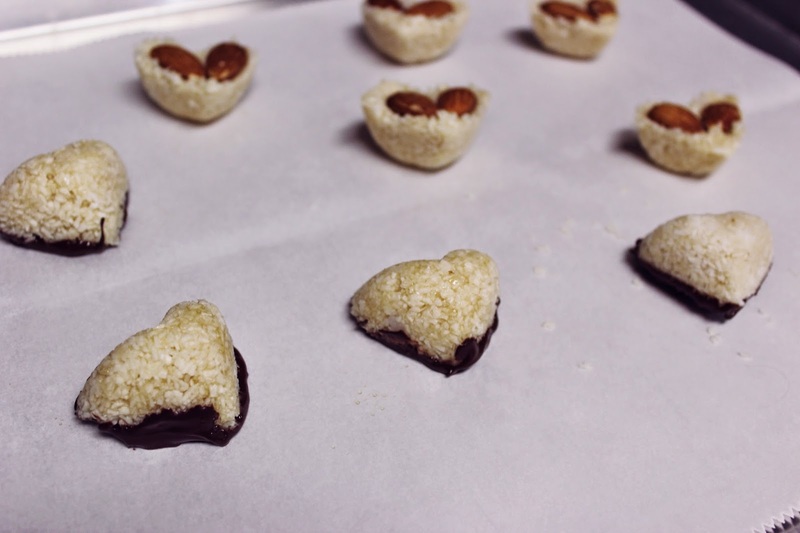 First, coat the bottom of each candy in chocolate, and then lay them chocolate side down onto the parchment paper. Continue until you've done this with every candy, and then pop them into the fridge for about 10 more minutes (or until they come clean off of the baking sheet). 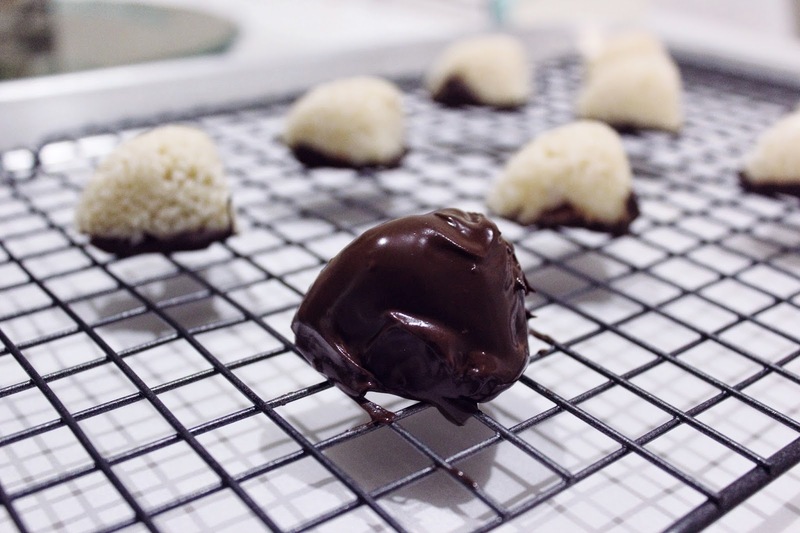 Place them onto a wire cooling sheet, over the cookie sheet. 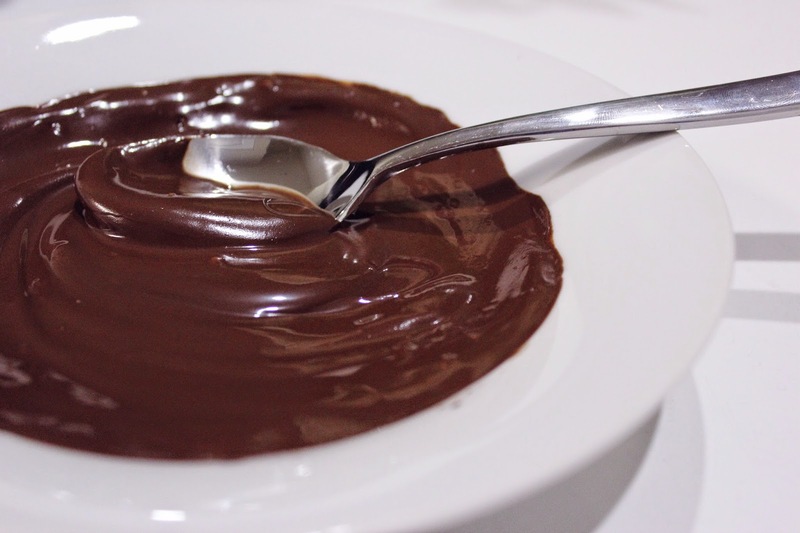 Then spoon the chocolate over each candy to coat it completely, letting excess chocolate drip below. 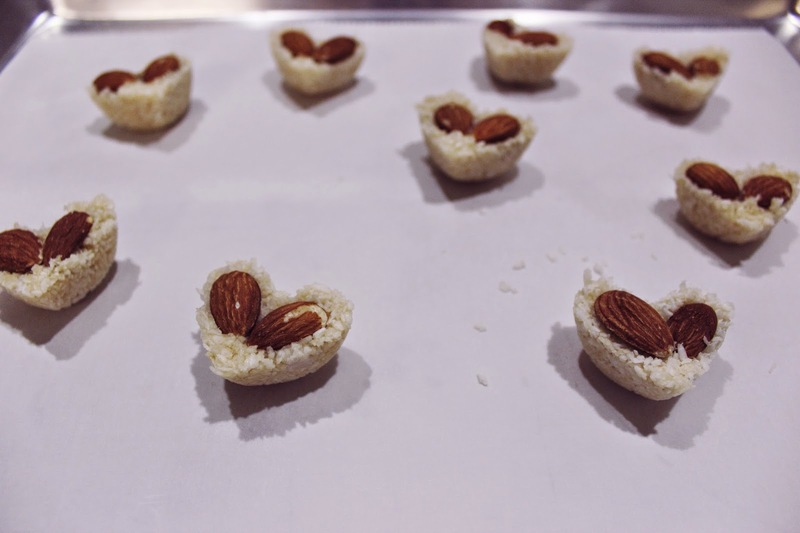 Once completely coated, sprinkle with a bit of extra coconut for a decorative touch. And voilà! A little messy, but so cute.